– Fikret, at the moment your team shows more than a respectable play in this competition. Let’s get to know your team a little. Please tell us about chess players. Zeinab Mammadyarova, Gunay Mammadzada, Gulnar Mammadova and Ulviyya Fataliyeva are playing in today’s round. – If you take the last two rounds, then, yes, we are playing well. 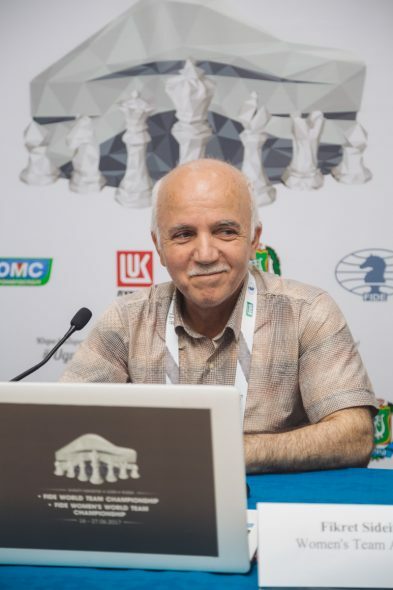 Almost a year ago we had the World Chess Olympiad in Baku, it was an unforgettable competition. For our women’s team, the Olympiad was very successful, we shared 4-9 places. For us it was a very honorable result, we were encouraged. The first three of our girls played there, it was our main “basis”. 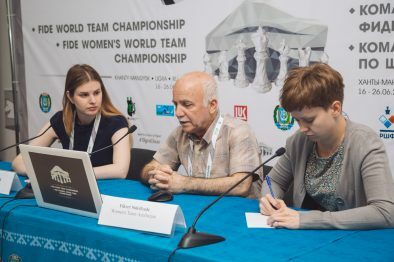 One of them is Gulnar Mammadova, who won the gold medal on the third board. By the way, she’s been my student for more than ten years. On the first board we have a well-known chess player Zeinab Mammadyarova. She is Shahriyar Mammadyarov’s sister, who is also a famous chess player in the world. Zeinab was the world champion at the junior championships, she has been the leader of our team for many years. Sometimes she plays worse, her ELO falls, but I always put her on the first board, because she has leadership qualities and can always lead a team, she plays very spiritedly. I will never forget her result in Khanty-Mansiysk in 2010, when she scored 9 points out of 11 on the first board, she played fantastically. Zeinab can win against anyone, although, unfortunately, sometimes she can lose to anyone. On the second board we have a young star Gunay Mammadzada, who performs for the second time for the team. She has medals of the world youth championships, several times she became the world champion and now she has smoothly started playing adult chess. Gunay is a stable participant; she shows a strong game, good knowledge of the openings and very strong nerves. I hope that she will please our chess fans for a long time with her results. At the Olympiad she also played very well, on the second board “+1”, this is a fairly good result and here she doesn’t yield the position – she has 3 points out of 4. I hope that she will maintain momentum until the end. 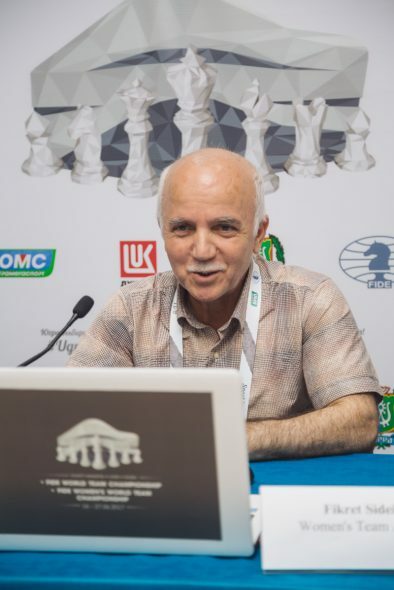 In the fourth round, Gulnar made a draw with the world champion Tan Zhongyi and saved the situation. I have already told about Gulnar Mammadova. She also has several medals of youth tournaments, several times she became the champion of Azerbaijan, but her highest achievement was at the 2016 Olympiad. Gulnar is very hardworking, very diligent, she loves to play, she studies, she never refuses and she is very persistent as well. If you look at her from the outside, you can notice it. Here she lost the first game, however, yesterday she won a very good game against the Chinese player, and I liked this game, I commended her. Let’s hope that this success will continue. Gulnar is a very emotional chess player, and if the game goes well, she can play very well. On the fourth board we have Ulviyya Fataliyeva. Several times she has been the medalist of European championships, the world championships under 18 years old. At the Olympiad, she played in the second team and showed a good result. 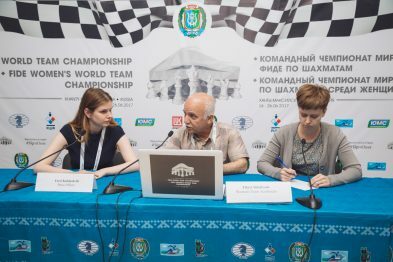 This year at the championship of Azerbaijan, then at the European championship, she showed a respectable game, good quality of the chess games, and now she is already in the team. The chess player is also strong and very stubborn. Our reserve participant Khanim Balajayeva is a very young chess player. In general, we have very good chess players. I rely on these four girls and we’ll see what will happen. Today’s match is also important, because after two draws with Russia and China in any case we can’t relax. Such teams as Vietnam, which at first sight seem to be unpretentious are very persistent. They are the most dangerous! Therefore, we need maximum mobilization.